Motorists with Attention Deficit Hyperactivity Disorder (ADHD) are more likely to violate traffic laws and cause accidents, psychologists said. 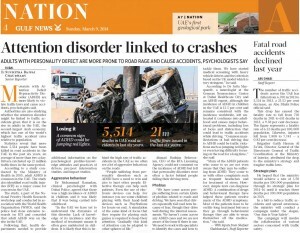 Authorities are also studying whether the attention disorder might be linked to traffic accidents given that it is on the rise in adults in the UAE, the second- largest Arab economy, which has one of the world’s highest traffic accident rates relative to population. Statistics reveal that more than 5,514 people have been killed in road accidents in the UAE in the past six years, an average of more than two a day. Drivers ratcheted up 21 million traffic fines in the same period. According to a study conducted by the Ministry of Health in 2010, adult ADHD is common in the UAE. The study also identified road traffic injuries (RTI) as a major cause for concern in the UAE. The study, a part of the National Priority Health Research workshop and conducted in association with the World Health Organisation (WHO), said the police had done extensive research on RTI and conceded that adult ADHD was on the rise in the UAE. Following that, needed health departments to provide additional information on the psychological profiles/ knowledge attitudes and practices of drivers, pre/ post intervention studies, and impact studies. Aggressive behaviour: Dr Mohammad Ramadan, clinical psychologist with Dubai Police, agreed that there was a high incidence of ADHD in children and it was likely that it was being carried into adulthood. “In the UAE we have yet to understand the dynamics of this disorder. Lack of knowledge of its incidence and the method of treatment means it often goes undetected in children. It is likely that this is behind the high rate of traffic accidents in the UAE as we often see a lot of aggressive behaviour on the roads. “People suffering from personality disorders such as ADHD have a need to win and also to hurt other people. Effective therapy can help such patients. Even the use of electronic devices can help. For instance you see some children playing with their hand- held devices such as PlayStations for hours on end. A simulation of the same kind of focus that they require for playing such games is required to keep their attention. 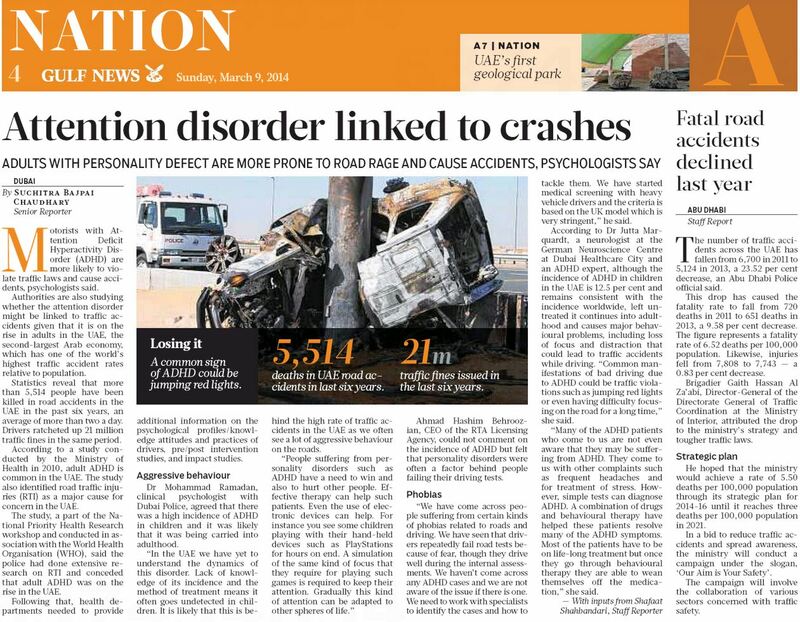 Gradually this kind of attention can be adapted to other spheres of life.” Ahmad Hashim Behroozian, CEO of the RTA Licensing Agency, could not comment on the incidence of ADHD but felt that personality disorders were often a factor behind people failing their driving tests. Phobias: “We have come across people suffering from certain kinds of phobias related to roads and driving. We have seen that drivers repeatedly fail road tests because of fear, though they drive well during the internal assessments. We haven’t come across any ADHD cases and we are not aware of the issue if there is one. We need to work with specialists to identify the cases and how to tackle them. We have started medical screening with heavy vehicle drivers and the criteria is based on the UK model which is very stringent,” he said. According to Dr Jutta Marquardt, a neurologist at the German Neuroscience Centre at Dubai Healthcare City and an ADHD expert, although the incidence of ADHD in children in the UAE is 12.5 per cent and remains consistent with the incidence worldwide, left untreated it continues into adulthood and causes major behavioural problems, including loss of focus and distraction that could lead to traffic accidents while driving. “Common manifestations of bad driving due to ADHD could be traffic violations such as jumping red lights or even having difficulty focusing on the road for a long time,” the neurologist from Dubai said. “Many of the ADHD patients who come to us are not even aware that they may be suffering from ADHD. 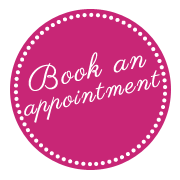 They come to us with other complaints such as frequent headaches and for treatment of stress. However, simple tests can diagnose ADHD. A combination of drugs and behavioural therapy has helped these patients resolve many of the ADHD symptoms. Most of the patients have to be on life- long treatment but once they go through behavioural therapy they are able to wean themselves off the medication,” the neurologist from Dubai said.